I’ve been photographing newborns professionally for more than six years and, in that time, I’ve learned some tricks and tips that will lead to a successful session. Many of these will depend on you, the parent(s). The better you follow this guide, the more likely it will be that we have a great session. 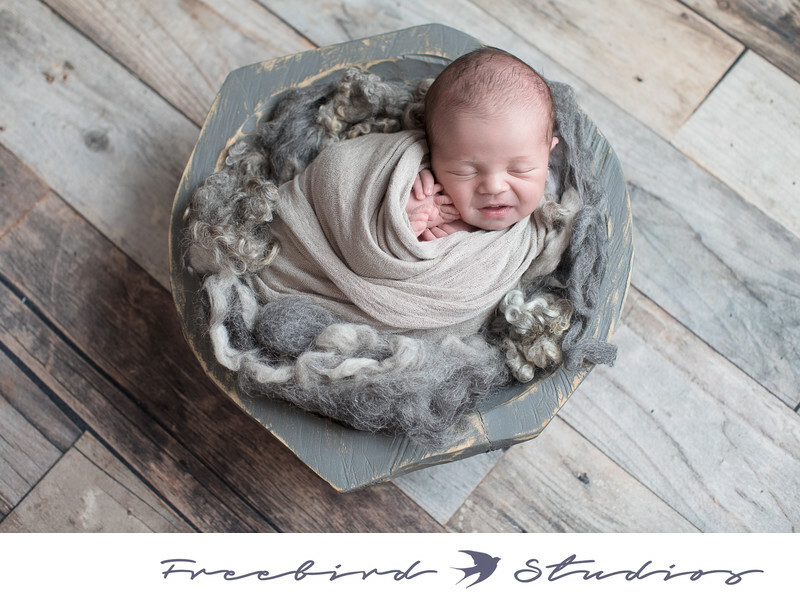 The best newborn sessions happen when baby is nice and sleepy. I will try to get images with baby’s eyes open toward the end of the session, but, for the most part, we want baby sleepy because that’s when they are calm and cooperative. Babies that are awake for their session tend to move so much that we can’t get our best shots unless they are wrapped up. Please try to keep baby awake for at least 1.5 hours before you leave the house for the session. If baby is awake before the session, they will likely sleep well during the session. A bath is a great way to wake them up and prep them for the session. Once you’ve given baby a nice long bath, dress them up in a button-up or zip-up outfit with NO ONESIE underneath. This will make it easy for me to undress them when you get to the studio. If we will be doing parent and/or sibling pictures, I suggest that you dress in neutral colored clothing- white, cream, or grey are my top choices. You will most likely only be photographed from the waist up, so don’t worry about your shoe choice. Feed baby as much as possible just before you leave the house. This should keep baby nice and full (and asleep) during the session. If you are exclusively nursing baby, I highly encourage you to avoid spicy or acidic foods the night before and please hold off on your coffee until after the session. This will help reduce the chances of baby having an upset tummy or being wide-awake from caffeine. If you have started pumping milk, please bring extra milk and a bottle so that I could feed baby during the session if they wake up. Please bring a pacifier, even if baby hasn’t take one yet or if you don’t think baby will like it. You’d be surprised what a difference a few seconds on the pacifier will make between a good session and a great session.